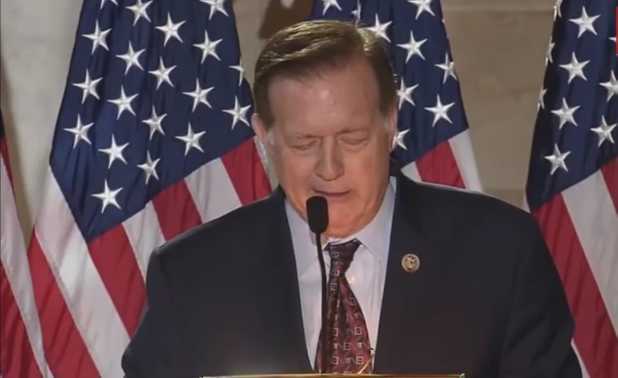 WASHINGTON — A Texas lawmaker tearfully implored God to forgive the manifold sins of the nation this week during a prayer gathering at the U.S. capitol. Rep. Randy Weber delivered a prayer at Wednesday’s “Washington—A Man of Prayer” event, which was organized to honor the life of America’s first president, George Washington. “‘Washington—A Man of Prayer’ commemorates the events of April 30, 1789, when, after being sworn in at Federal Hall, President Washington, accompanied by Congress, proceeded to St. Paul’s Chapel where, as one of his first official acts, the president offered a prayer of dedication to God on America’s behalf,” the event website outlines. Organizer Dan Cummins said that the gathering is in its fourth installment, and the use of Sanctuary Hall for the prayer gathering was approved by Speaker Paul Ryan. The 2017 gathering was hosted by Sen. Steve Daines, R-Mont., and Rep. Tim Walberg, R-Mich.
During the “Man of Prayer” event, as Weber took the podium, he asked—like Christ taught His disciples to pray in Matthew 6:9-13—that the Lord’s will would be done on Earth as it is in Heaven. Weber then proceeded to outline the ways that God’s will is not being carried out in the United States. “Father, we think we’re so smart. We’ve replaced Your word and You precepts with drug-sniffing dogs, with metal detectors, with uniformed police officers in our schools,” Weber lamented. The Texas lawmaker became visibly moved as he spoke of how the nation has sought to redefine God’s design for marriage, and to kill our own children in the womb. “Father, we’ve trampled on Your holy institution of holy matrimony and tried to re-write what it is, and we’ve called it an alternate lifestyle. Father, please, please forgive us,” Weber prayed, becoming tearful, his voice breaking. Weber also noted that even Abraham Lincoln observed in his day that the people of America had neglected their Creator. Weber’s prayer moved others in the room as well, as camera operators captured a man with tears wetting his face as he listened to the lawmaker’s words.